The All-Star Rest Area in Super Smash Bros. for Wii U. The All-Star Rest Area (オールスター休憩所, All-Star Rest Stop) is a stage in Super Smash Bros. Melee, Super Smash Bros. Brawl, and Super Smash Bros. 4 which appears in the All-Star and Boss Battles modes. Players appear in the stage between each of the game's fights to regroup before the next bout. The stage contains a teleporter which brings players to the next level, and also has up to three Heart Containers (or six if playing in co-op mode) which heal all of the player's damage, instead of the usual 100%. The Rest Station in Melee. The Melee version of the teleporter is a sort of hybrid between the Super Smash Bros. universe and the Kirby universe. The area consists of a path winding through what appears to be a lightly forested park. A resting area with a bench and fountain, complete with large lights, can be seen in the background. Occasionally, after three matches, the player may find a trophy in this stage. 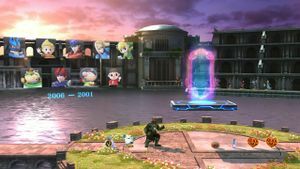 Trophies of defeated characters sit on the ground in the background while portraits of upcoming opponents float above them. Due to a glitch, if the player enters the teleporter after picking up one of the Heart Containers, their damage will remain at the percentage it was at when they entered, regardless of whether or not the player has finished healing. The player should wait until their damage is reduced to 0% before entering the teleporter. This glitch was fixed in subsequent installments. The All-Star Rest Area is available through Melee's debug menu (known internally as HEAL), and it can be used as a stage for versus battles. However, the stage's design renders it impossible to KO opponents, unless attacks are modified to inflict extremely high levels of knockback, after which players can potentially clip through the stage's walls. Furthermore, if player 1 touches the teleporter, either the screen will fade to black as usual and freeze the game, or the match concludes. Characters can move out of the screen in the All-Star Rest Area but will not suffer Hoop damage. The Rest Station in All-Star in Brawl. The stage reappears in Super Smash Bros. Brawl in both the All-Star and Boss Battles modes. In Brawl, it is a dimly lit cave where light shines down onto the teleporter from a hole in the ceiling. There are two kinds of flowers in this cave: a small one resembling a clover whose bloom glows white under the character portraits; and a large flower, resembling either an orchid or a lily, glowing a translucent indigo on the right wall, above the Heart Containers. Note that playing All-Star or Boss Battles with two players will result in there being 6 Heart Containers instead of 3. Trophies can again spawn in the area. Like its Melee counterpart, it can be played through hacking, but once Player 1 or 2 goes into the teleporter, the stage goes pitch black. Mr. Game & Watch's icon will always be in the background when hacked (because he is the first to be fought in All-Star mode), despite the fact that this not possible in actual gameplay. No one can be KOed, as the stage is completely enclosed. The Heart Containers can be used. The All-Star Rest Area in Super Smash Bros. for Nintendo 3DS. The All-Star Rest Area reappears in Super Smash Bros. 4, with different designs between the two versions. The 3DS version features the area as a ruined fortress, while the Wii U version instead features an island in the centre of a large, expansive coliseum; the latter also features a ledge in the background where trophies appear, though the 3DS version does not feature character trophies in its Area. As in the previous installments, trophies may appear as a reward, as well as coins or character customization parts. Recovery items include a Maxim Tomato, a Fairy Bottles and Special Heart Containers, of which there will be always be one. Another Heart Container is available if playing when all unlockable characters have been obtained; having every downloadable character, however, has no added effect. In the 3DS version of the game, the stage gradually progresses from dawn to dusk as All-Star Mode is played through. A save point in The Great Cave Offensive. The concept of a resting area between fights with optional healing items comes from Kirby Super Star, with both The Great Cave Offensive and The Arena sub-games as possible inspirations. 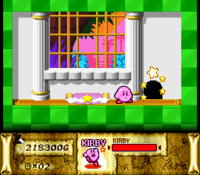 The Great Cave Offensive features special rooms which allow Kirby to save the game. They contain a button that spawns a Maxim Tomato to fully restore not only Kirby's health, but also his partner's if he has one. The mode also involves Kirby collecting items from other video game series (including Zelda and F-Zero), which is similar to how All-Star involves collecting character trophies from other series. The music that plays in Melee's All-Star Rest Area is also a remix of the music played in the Save Cottages during The Great Cave Offensive in Kirby Super Star. The Arena, however, works more similarly to Smash Bros.'s All-Star Mode. It is a boss rush, where Kirby has to fight the bosses in the game one by one. At the end of each fight he is transported to an area which contains three Maxim Tomatoes - which, if collected, in subsequent visits become apples and then disappear - as well as two random copy abilities, a picture of the upcoming opponent and a teleporter to the next battle. Notably, in Kirby Super Star Ultra the original Arena background music was replaced with the Save Point theme. The Rest Station in Boss Battles in Brawl. Piece of background in Melee's All-Star Rest Area showing a textureless fountain, a bench, and a light post. Prior to SSB4, the player could still accumulate damage in the area using moves which are capable of damaging the user, whether it was from recoil damage like from Roy's Flare Blade or damaging hitboxes like Snake's Hand Grenades. Smash 4 negates all damage done to the player in the All-Star Rest Area. In Melee, Mr. Game & Watch could potentially heal himself in the All-Star Rest Area by spawning fruit if he got a 7 with Judge, making him the only character in the game that could potentially heal himself in the area. Using Wario's Chomp to consume any of the healing items in Smash 4's All-Star Rest Area will not heal him by 1.5 times the item's normal healing power like they do in combat. Interestingly, the portraits of Lucas, Roy (as pictured above), and Ryu in Super Smash Bros. for Wii U uses their in-game models rather than their official renders. This is also the case for Corrin by looking at the in-game files, but his portrait never gets used due to being one of the opponents fought in the first stage. This page was last edited on April 4, 2019, at 08:10.